With increasing worldwide access to the Internet and the widespread use of mobile devices, shopping online is on the increase. At the same time, the sales potential on international marketplaces is constantly growing. In this section we’ll give you insights into international marketplaces. We will feed you quality ecommerce data about online markets in particular countries. 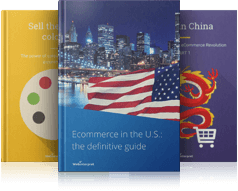 Whether you’re interested in selling online in Germany, France, the U.S. or China, our articles will inspire you to do some research and will boost your confidence in testing international waters!